Don't you love it when the blog schedule gets messed up. Makes things so much fun. That last blog post was suppose to have been posted last night before midnight, I see the timer only went off an hour ago. No, Blockbuster here where I live does not open that early in the day, and no I'm not out of my pajamas yet this morning. But, I did get my claws on a copy of Priest on dvd. Much less vomit inducing in plan 2D, made it easier to watch. I now look forward to a Priest sequel. I'm in full on vampire movie mode this week. And loving every juicy second that I'm able to sink my teeth into. I did see a few extra vampire dvds being promoted this week at Blockbuster and HMV because of both Priest getting is dvd release and of course Fright Night getting released in cinema tomorrow. You know I was in bloody heaven. Which brings me to this question... why is it when you stumble upon one of those double or triple or four favs films on one dvd that it's always got one you want to see but the others are ones you've already bought before? Ever notice that? I spent a nice chunk of years trying to find some of the old Christopher Lee Hammer Dracula films, had to hunt them down under their many titles as Hammer used to release things back in the day under one name in England, another in Canada/US, another in Germany etc. And now, I see a single dvd that has 4 of the long sought after titles together. After I spent something like 5 years tracking down, special ordering, cross referencing, etc certain titles, now ... NOW they are available in a single 4 favs films pack! And you know what, Spudguns and Spuddy; I still have not found my original Fright Night tee shirt. 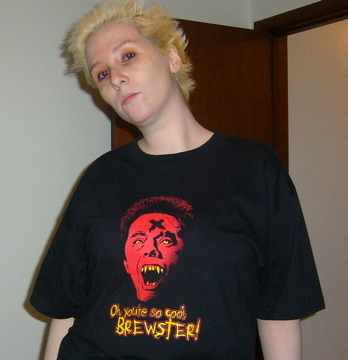 The one I got from Fright Rags back in 2007 with the logo of Evil Eddie saying "you're so cool Brewster". It's been missing for over two years. I'm starting to think an ex-boyfriend stole it.